The private accommodation market in Europe is significantly larger than in the U.S. According to a new Phocuswright Global and European Edition publication, more than twice as many British, French and German travelers – as a percentage of the respective traveler populations – have stayed in private accommodations over the past year. France, Germany and the U.K. alone are home to some 33 million rental travelers versus just 22 million U.S. travelers. Europe's rental traveler population is growing, reports Phocuswright's Share This! Europe: Private Accommodation and the New Rental Traveler. The percentage of travelers who have rented a home, flat, villa or cottage rose significantly in 2014 in the U.K. and France, reflecting both an improving overall economic environment and demand for travel, as well as rising awareness and use of private accommodations. Only in Germany was there a slight downturn, likely reflecting the slowdown of the broader economy there. "Although the U.S. is home to two of the largest innovators in private accommodation – Airbnb and HomeAway – Europe presents a substantially larger opportunity," says Phocuswright's vice president, research, Douglas Quinby. 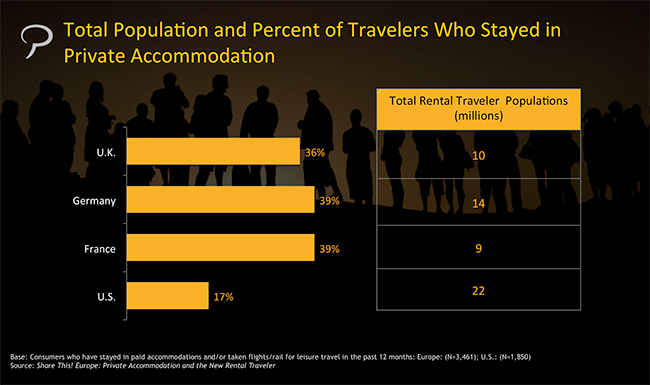 "The percentage of European travelers who rent is more than twice that of the U.S."
Phocuswright's Share This! Europe: Private Accommodation and the New Rental Travelerprovides deeper insight into European rental travelers – to assess who they are, how they travel, what they want, and how they shop and book. This study examines the potential overlap between the rental and hotel markets, including the extent to which renters consider and stay in hotels, as well as whether non-renters consider private accommodation. The analysis also looks at emerging trends among rental travelers in terms of demographics, travel behavior and use of consumer technology. Gain insight into Europe's booming rental market and the type of traveler these accommodations draw with Phocuswright's Share This! Europe: Private Accommodations and the New Rental Traveler.